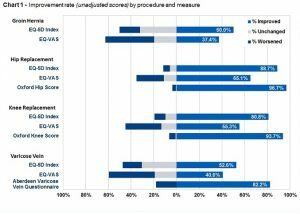 It is interesting that despite the complex case mix adjustment and statistical work behind the figures, the headline figures are simply “What % of people reported an improvement”. One wonders whether a simple single question to the patient of “Did having this operation improve your condition” might achieve this quicker and more cost effectively. The results of the EQ5D- VAS continue to be vague with as many patients reporting their health has worsened as those reporting an improvement and no correlation to the other measures. 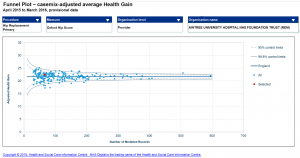 Using the downloadable spreadsheet, organisations can see their own results for each PROM shown as the Change in Score as a result of surgery, compared with the national average change in score. Given that the PROM scales are not standardised or normalised in any way, it is difficult to compare them. It still doesn’t say whether a change of say 12 PROM scale points is good, bad or indifferent. With a bit of spreadsheet work, for a particular PROM you can rank providers by the adjusted health gain which gets more interesting. For example the Health Gain for the Oxford Hip Score for primary hip replacement patients ranges from 17.2 to 25.2 against an England average of 21.7. Not a huge spread. We would like to see these results translated from their theoretical, often academic domain into something more tangible such as comparing (case mix adjusted) results for different surgeons and providers by the average % improvement of their patients.